Neurogenic orthostatic hypotension is a cardinal feature of generalised autonomic failure and commonly is the presenting sign in patients with primary autonomic failure. Orthostatic hypotension can result in considerable morbidity and even mortality and is a major management problem in disorders such as pure autonomic failure, multiple system atrophy and also in Parkinson’s disease. Treatment is ideally two pronged, using non-pharmacological and pharmacological measures. Drug treatment ideally is aimed at restoring adequate amounts of the neurotransmitter noradrenaline. This often is not achievable because of damage to sympathetic nerve terminals, to autonomic ganglia or to central autonomic networks. An alternative is the use of sympathomimetics (that mimic the effects of noradrenaline, but are not identical to noradrenaline), in addition to other agents that target physiological mechanisms that contribute to blood pressure control. L-threo-dihydroxyphenyslerine (Droxidopa) is a pro-drug which has a structure similar to noradrenaline, but with a carboxyl group. It has no pressor effects in this form. It can be administered orally, unlike noradrenaline, and after absorption is converted by the enzyme dopa decarboxylase into noradrenaline thus increasing levels of the neurotransmitter which is identical to endogenous noradrenaline. 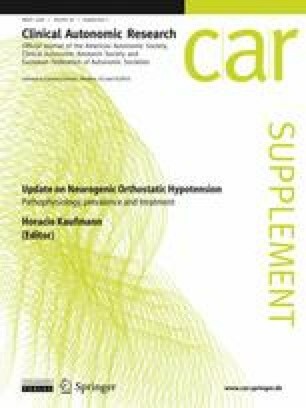 Experience in Caucasians and in Europe is limited mainly to patients with dopamine beta hydroxylase deficiency. This review focuses on two studies performed in Europe, and provides information on its efficacy, tolerability and safety in patients with pure autonomic failure, multiple system atrophy and Parkinson’s disease. It also addresses the issue of whether addition of dopa decarboxylase inhibitors, when combined with l-dopa in the treatment of the motor deficit in Parkinson’s disease, impairs the pressor efficacy of Droxidopa. Major investigators have included Professor P Cortelli, Professor J M Senard, and many colleagues in participating centres. Disclosure Prof. C.J. Mathias was the Principal Investigator of both studies reviewed, which were supported by Sumitomo Pharmaceuticals, Japan. He is a Consultant for Chelsea Therapeutics, USA.